Without a baby, a day trip can be exhausting. First, driving 1 - 3 hours to get to the destination. Then the actual tour. Then another long trek home. With a baby, a day trip can be plain overwhelming. So, how do you see everything you want to see when traveling with a World Toddler? One option is to leave Baby home. Mom and Dad can take turns watching the baby. This is exactly what we planned to do in Port Douglas, Australia: I would stay back with Sydney in Port Douglas, so Nolan could take a day trip to see the Rainforest, a trip which would just be too much for the whole family. 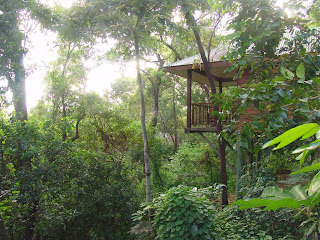 lodging at this magnificent "Eco- Retreat". From Australia's only guided coconut tour (Thala is located on a coconut plantation) to butterfly tours, we will be able to wake up fresh, and step right into the day's adventure. If Sydney needs a nap, the lodging is nearby, so we don't have to worry about ruining the trip for everyone in the group. 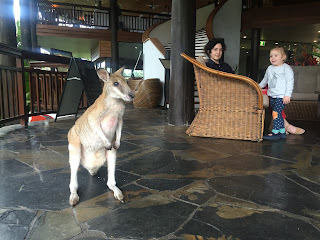 In fact, at Thala, you're so immersed in Adventure, it seems, that you might just meet a friendly wallaby in the lobby!